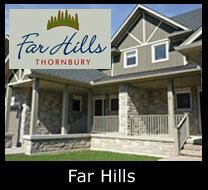 Far Hills, Thornbury condominium townhome and condo real estate offer a variety of gracious living features. Amenities include outdoor swimming pool, tennis court and club house. Far Hills is within walking distance to the boutiques and restaurants of downtown Thornbury, Thornbury Marina, Georgian Trail, as well as the beautiful waters of Georgian Bay.There are 39 Townhomes in Far Hills, Thornbury, of which fifteen back onto Little Beaver Creek. Some of the units have a walk-out lower level and others have a main floor Master Suite. Standard in all townhomes are spacious sun decks, 9 foot ceilings in the basement, single or double car garages, stainless steel appliances, washer/dryer, 2 full baths and powder room. The units range in size from 1,812 to 2,405 square feet.The 48 luxury condo suites at Far Hills, Thornbury are located in two lodge buildings, each having three floors with elevator, and 8 suites per floor. Both buildings have a magnificent entrance lobby. Suites range in size from 974 to 1,473 square feet. Each suite has access to an underground parking space with a spacious adjacent storage room. Amenities: Deck/patio, swimming pool, tennis court, clubhouse, garage or underground parking, landscaping, snow removal. Walk to Thorbury stores and restaurants.